Find out "Ways To Fight The Bite!" Southern Mosquito Control Services, Inc. provides mosquito and midge control services to homeowners associations, resorts, and golf and country clubs. Our focus is to treat for the target species without affecting or harming the beneficial insects such as honeybees, butterflies, and lady bugs. All of our products are extremely effective, safe, and EPA approved. 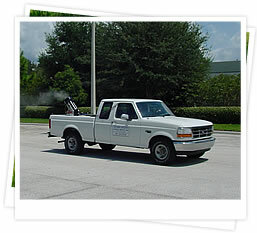 Our treatments include Adulticiding or fogging of the community with a truck mounted fogger. We also have ATV and handheld units for getting into the tight or wooded areas. Adulticide (Fogging): This phase of treatment is the most commonly used method of controlling mosquitoes in Florida today and provides the most effective coverage, which dramatically reduces excessive nuisance or vector mosquito populations. Truck spraying to kill adult mosquitoes is an essential part of our mosquito control program, and the part that citizens see most often. Our fog trucks are equipped with quiet, electrically driven machines using ultra low volume (ULV) technology, spraying a fine mist of concentrated chemical. Minimizing pesticide impact on non-target organisms has always been vital to public acceptance and was incorporated into the goals of the mosquito control community. The present day need to be species specific in the selection and application of pesticides is fundamental to the methodologies we use. Larvicide: This part of the Florida mosquito program emphasizes the elimination of mosquitoes in the nursery areas. 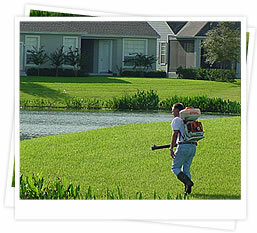 We provide treatments to retention ponds and low-lying areas. The advantage being that entire “broods” are targeted in the immature stages of development, at the breeding habitat. This prevents the later stage of development, the biting adults. Treatment is performed when the presence of eggs, larvae or pupae are identified. We use chemicals that are environmentally friendly and accepted by the FL Department of Environmental Protection. Storm Drains: Did you know that storm drains are massive breeders for mosquito larvae? These areas, if not flushed out often as with our summer rain storms, can collect in stagnant water which provides the perfect breeding ground. We can assist with the treatment of these basins to complement any program. Barrier Treatments: Sometimes barrier treatments are required to mitigate problematic insects. These treatments are conducted on an as need basis as they tend to be detrimental to beneficial insects such as honeybees, ladybugs, butterflies, etc. Extreme care must be exercised. Midge Control: We also provide quality midge control services. These services include larvaciding the affected waterway by treating the lake bottom or water surface depending upon the species you are impacted by. We also treat for the adults by adulticiding or fogging around the waterway and homes. Finally, if needed, we can apply barrier treatments to grassy areas and shrubs around the ponds where the adults are resting. Special Mosquito Control Services: Barrier applications of a specified area for special events and/or recreational areas. We utilize our fog trucks as well as hand held fogging units for the hard to reach problematic areas. Ways To Fight The Bite! Now, more than ever, it is important to be vigilant and aggressive in our fight against West Nile Virus, Zika Virus, and other mosquito-borne diseases. You can take simple, positive steps to help reduce this menace right at home, since many generations of mosquitoes can breed right in you own back yard. With greater public participation, mosquito populations can be reduced. The benefits are immeasurable, not only because of the health benefits, but more simply, for the outdoor enjoyment and enhanced quality of life which it brings to our residents. Get the kids involved and make it a family project! © 2004 Southern Mosquito Control Services, Inc. All Rights Reserved.